Join Georgeen Theodore, Tobias Armborst and Daniel D’Oca from New York firm Interboro Partners. They’ll present their book The Arsenal of Exclusion & Inclusion in which they examine some of the policies, practices, and physical artifacts that have been used by planners, policymakers, developers, real estate brokers, community activists, and other urban actors in the United States to draw, erase, or redraw the lines that divide. 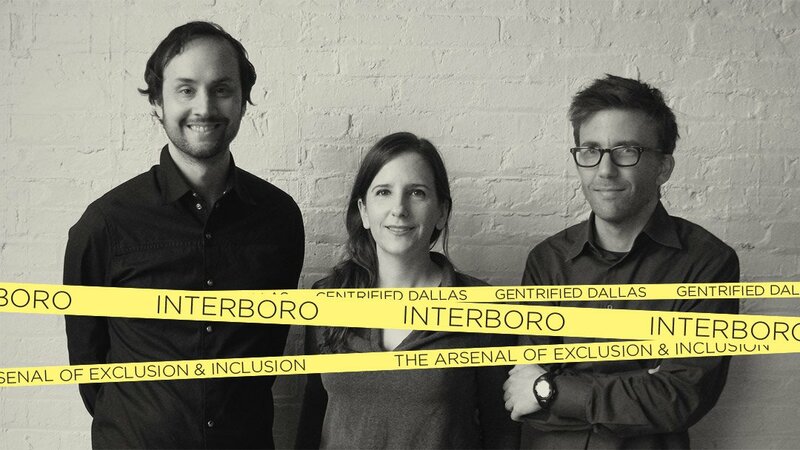 Interboro is an award-winning, Brooklyn-based firm offering inventive and inclusive architecture, urban design, and planning services. The foundation of their work is good listening, keen observation, and productive community engagement. Their participatory, place-specific approach creates consensus around complex projects ranging from buildings, parks, and open spaces to neighborhood, city, and regional plans. Gentrified Dallas: A month-long investigation into the story the city is telling is curated by Mark Lamster, architecture critic at the Dallas Morning News, in collaboration with University of Texas at Arlington’s College of Architecture, Planning and Public Affairs.